What a coincidence… in October 2012, Jay Leno visited the Nissan Design Studio in Japan. We saw a silhouette of the next Nissan Z in that design studio, and that silhouette was significantly different from today’s Z – it looked like a 240Z. The proportions of which may suggest a different platform going forward. And the talk in the video by Jay was of the 240Z and of getting back to that ideal. 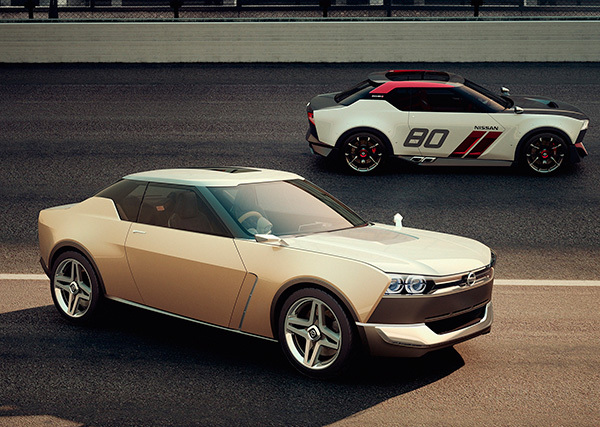 And it now that same studio has produced the Nissan IDx concept, a thinly veiled Datsun 510 type of car. Which as we know has been approved for production in a couple of years. So here’s some speculation (with no basis from anything announced): since the IDx is apparently built on a new lightweight rear wheel drive platform (vs. the existing and much heavier FM platform used by everything from the current 370Z to the Infiniti G50 and up to the larger Infinitis), will that same platform also be used for a future lightweight Z? The Z could stand to lose more than a few pounds and this new platform would provide the means of doing that. All speculation for now. But congratulations to Nissan for going ahead with the IDx, and we look forward to seeing it in a few years. Along with several more exiting Nissans coming up including the next GT-R and at some point the next Z.
Jay likes what he sees in this prototype, and of course he even gets to drive it – on the streets no less!